Visit Africa's most forgotten Island in congo! A comprehensive Guide to idjwi island in congo featuring useful info on how to get there, traveling around, where is idjwi island, community projects on the island, Reliable tour operators in congo, When visit, Idjwi island culture and people around the island .Find the complete information guide to help you during the visit to Islands on lake Kivu from the congo side, ferries to the island. Idjwi is an island in Lake Kivu, belonging to the Democratic Republic of the Congo. At 70 km (43 mi) in length and with an area of 340 km2 (131 sq mi), it is the second largest inland island in Africa, and the tenth largest in the world. Idjwi is roughly equidistant between the DRC and Rwanda, with 10 to 15 kilometres (6 to 9 mi) separating its western shore from the DRC mainland and a similar distance between its eastern shore and the coastline of Rwanda. The island’s southern tip, however, lies only 1 kilometre from a promontory of the Rwandan coast. This mountainous island surrounded by the serenity of Lake Kivu is one of the most beautiful places I have travelled to. The lush greenery and the view of the vast and calm lake is a photographers dream and it’s among the reasons why travellers connecting from Goma to Bukavu are advised to check out on this famous islands. Historically a clan-based society, Idjwi Island became a kingdom in the late 18th century (roughly between 1780 and 1840). Idjwi lies within the Sud-Kivu province of the DRC. Accommodation: There is a wide range of places to stay in the Idjwi island Ecosystem. There is also a very good idjwi island Map if you would like to know more about the general size and area. A guide to Safari accomodation to enjoy the stay at idjwi island in congo , we list the main accommodations & camping sites on the island with only two lodges. Some of the best camps and lodges are fabulous destinations in their own right, almost as interesting as the way of locals around them! Other Tourists Attractions Near Idjwi Island. Mountain Gorilla Trekking in Virunga National Park, Democratic republic of congo is famous for the Mountain Gorillas that can be only spotted in virunga mountains , Plan a Congo Gorilla Safari to enjoy gorilla trekking in democratic republic of congo with Gorilla Expeditions limited. Plan for a Gorilla trekking Tour to visit the primates in Democratic republic of congo while on safari vacation to Idjwi island. Eastern Lowland gorillas & Mountain Gorillas can be combined with a stop over at Idjwi island for Relaxation . Planning for Water transport to cross from Kahuzi biega National Park to Virunga National Park? In democratic republic of congo on lake kivu there are various ferry companies that operators these routes from Goma to Bukavu at the most discounted price . 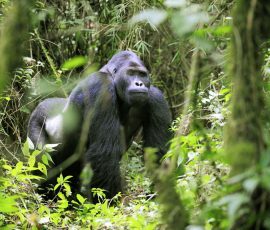 Dont get worried of where to stay while on a gorilla safari to congo as there are various safari lodges & Hotels in Goma and Bukavu even on the idjwi island to make your safari holiday to congo worthy the stay, Once the you travel with a reliable tour operator, you will enjoy the adventure to africa. Location & where is Idjwi Island . Dont miss the chance to visit the largest island on lake kivu and the second in Africa that has been spared by the civil wars that have been taking place in congo. Explore the beauty of Democratic republic of congo.